St. George, Utah • Nevada rancher Cliven Bundy claims the April confrontation between the federal government and his armed supporters was part of an age-old spiritual battle between good and evil. Bundy, a Mormon, told an Independent American Party gathering in St. George, Utah, on Saturday that God provided him personal inspiration in the showdown over cattle in Bunkerville, Nevada, about 80 miles northeast of Las Vegas. "The Lord told me ... if (the local sheriff doesn&apos;t) take away these arms from federal agents, we the people will have to face these arms in a civil war. He said, &apos;This is your chance to straighten this thing up,&apos;" Bundy said, according to The Spectrum of St. George (http://bit.ly/1pRx8nq ). The U.S. Bureau of Land Management backed down in the standoff, citing safety concerns. Bundy&apos;s allies subsequently released the 380 cattle collected from the range during a weeklong operation. BLM officials have said Bundy will be held accountable for his role in the standoff and they continue to pursue the matter "aggressively through the legal system." The case remains under investigation by the FBI and U.S. Justice Department. Clark County Sheriff Doug Gillespie has said Bundy crossed the line when he allowed states&apos; rights supporters, including self-proclaimed militia members, onto his property to aim guns at police. The federal agency says Bundy owes over $1 million in fees and penalties for trespassing on federal property without a permit over 20 years. 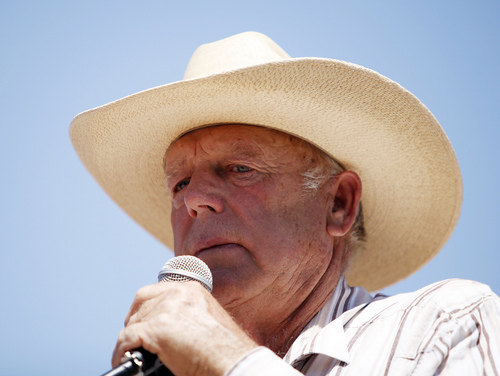 Bundy, a states&apos; rights advocate, refuses to acknowledge federal authority on public lands. Bundy said people from across the country rallied around him because they were "spiritually touched," and he suggested they would not have prevailed had God not been on their side. "If the standoff with the Bundys was wrong, would the Lord have been with us?" he asked, noting no one was killed as tensions escalated. "Could those people that stood (with me) without fear and went through that spiritual experience ... have done that without the Lord being there? No, they couldn&apos;t."
About 100 to 120 people attended Saturday&apos;s gathering, and Bundy questioned why more people were not present. "Where is all of your college students? Where&apos;s our young and where&apos;s our old? Where&apos;s our black and where&apos;s our brown?" he asked. "Where are you people? Aren&apos;t you interested in freedom and liberty?" Other Bundy family members talked about how they fasted and prayed for the spirit of their forefathers to be with them as they prepared on horseback to defy the Bureau of Land Management&apos;s efforts to impound the cattle.